You are here: Home » China Watch » Nepal-China BRI projects a non-starter? (TibetanReview.net, Apr15’19) – China’s ambitious Belt and Road initiative (BRI) with Nepal may be a non-starter due to enormous technical as well as economic challenges that beset it unless Kathmandu is prepared to sacrifice strategic national interests to follow the well-trodden doomed path towards debt trap taken by Sri Lanka and Pakistan before it, reported the ANI news service Apr 13, citing Amsterdam-based European Foundation for South Asian Studies (EFSAS), which has closely studied the ground situation. The report noted that in May 2017, Beijing signed a Memorandum of Understanding (MoU) on the BRI with Kathmandu for the purposes of opening new connectivity routes through building roads, railways, ports and aviation, alongside further investments in communication technologies, hydropower and energy projects, finance and tourism. At the heart of the deal, however, lies the project to build a railway line through the rugged Himalayan Mountains, which will eventually link the Chinese-controlled region of Tibet with Kathmandu. Land-locked Nepal has for years been beseeching China to build this railway both to reduce its over-reliance on India for essential supplies and foreign trade as well as in the hope of benefiting from a new Sino-India trade link passing through its territory as a result of it. But despite Nepal’s hope otherwise, China does not give grants in billions of dollars for its BRI projects and Kathmandu will have to pay high interest rates for the loans it will have to take from the latter for this purpose. “On one side, the question arises whether the envisioned transit project is technically feasible considering the complex geological terrain and arduous engineering work,” the report quoted a statement by the Nepalese Department of Railways, as saying. It noted that around 98.5% of the railway line will be bridges and tunnels. On the other, the question also arises “whether the project, which could cost up to $7-8 billion, is financially attainable in light of Beijing’s legacy of building up debt in countries which go for the BRI, , the report quoted a research by EFSAS as saying. Billions of dollars would be required for China-Nepal connectivity plans specifically for the Shigatse-Kathmandu Rail Link and Nepal Government does not have these funds, the report noted. The report quoted EFSAS research analyst Yoana Barakova as saying, “China does not give financial grants for the BRI venture but loans at high-interest rates which Nepal cannot afford. So, in that sense, the plan is a non-starter”. Besides, the report noted, even assuming that there is a connectivity corridor in place, there is no guarantee of access to the Indian market for Chinese products through Nepal. In addition, the contrast between free border movement between India and Nepal with the restricted movement between Nepal and Tibet shows that Nepal can never hope for the same degree of openness that it enjoys with India and that in sense the BRI remains non-viable for Kathmandu, the European think tank was cited as saying. 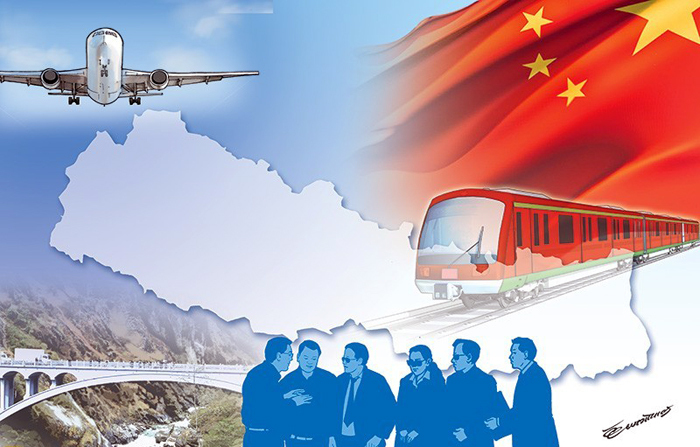 The report further noted that while China had committed to carry out several development projects in Nepal including upgradation of Gautam Buddha Airport Project at Bahiragawa; Tribhuvan International Airport; Construction of Dhalkebar Substation and Chameliya Hydropower Project in Darchula, they have been beset with delay in implementation, raising concerns that China is not living up to its commitments.